Tusker FC head coach Robert Matano wants his side to begin the season in style and fight for the crown. The seasoned coach has said that his award as the September/October Sports Journalists Association of Kenya coach of the month will spur him to lead the team to a victorious start. Matano was belatedly honored by the Sports Press for leading the brewers to an unbeaten run in the final two months of the season, Tusker winning four and drawing one of their fixtures. The tactician was visibly surprised and delighted with the award dished out to him at the club’s training ground on Tuesday. “I did not know that I would get this award but it makes me very happy. 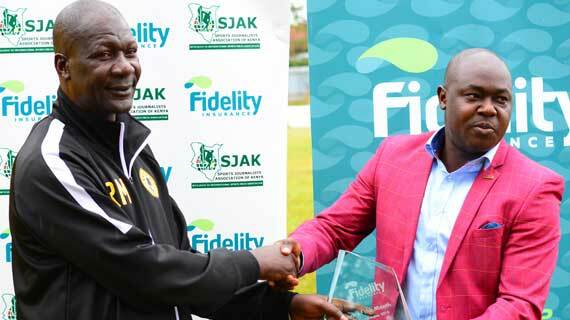 I’m grateful to my players who worked hard and I want to urge them to work harder and pick the players’ award as the season begins,” Matano said after picking the award. The tactician joined Tusker in April this year, helping them to rise to a third placed finish having picked them willowing in the relegation slots. In the last two months of the season, they began September with a 2-0 win over Thika United before fighting to a 2-2 draw with Mathare United at Ruaraka. From then, they registered three straight wins, demolishing AFC Leopards 4-0 in Machakos, beating Nzoia Sugar 1-0 in Bungoma and winding up their month and season with a 1-0 win over champions Gor Mahia. The brewers who have won the KPL 11 times begin their quest for a 12th title on Saturday away to Sony Sugar.